When it comes to installing fixed seating, experience is crucial. If you require installation services, your Project Coordinator will assist you with scheduling an installation crew. You have several options for the installation process. 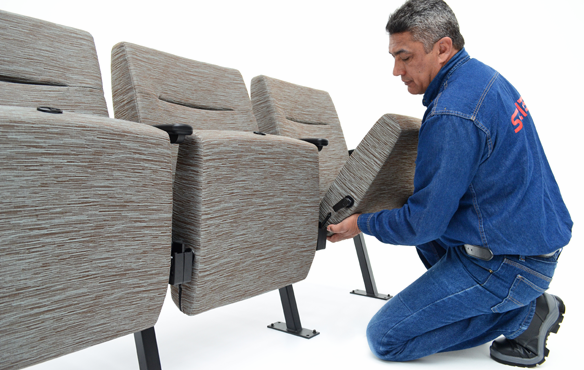 Series Seating established Series Installation, an installation team with over 30 years experience and expert working knowledge in SERIES Seating systems. This team will ensure that the setup and layout goes as planned, eliminating all stress in the installation process. They will handle everything from unloading, setup, and installation to the end clean up, delivering a successful completion of your seating project. Series Installation crews have installed over one million SERIES seats worldwide. SERIES also has trained and certified independent contractors that can successfully install SERIES Seating systems. However, if you would prefer, we can provide a technician to train you on how to install your seating system yourself.